Creative kids love our sewing birthday parties. 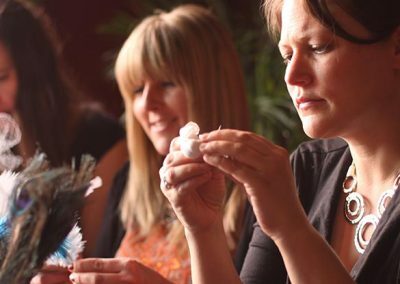 Design your own bespoke craft party or choose from some of our ideas. From making clothes for beloved teddies and dolls to sewing individual party bags. We have lots of fun and simple project ideas to choose from. During the workshops we use a mixture of hand sewing and basic machine sewing, all with patient and attentive supervision. The emphasis is always on productive and creative fun, and no-one goes home without a creation to be proud of! You are welcome to bring along a birthday and drinks. We have a cake stand and pretty vintage plates to serve it on. The party workshops are around 2 hours long and are led by experienced DBS cleared and experienced teachers. Prices start from £20 per person, the birthday child goes free. Includes party invitations and a bag to take the creations home in.